For heavy duty /mill duty operation, cast iron/ aluminum body, surface mounted on control desk. Heavy duty operation, open execution, mounted under control desk top cover with joy stick handle protruded up above the control desk. Also available in sheet steel enclosure for surface mounted on control desk. Current Rating (Amps) 1.5 AMP. TO 10 AMP. Current Rating (In Amps) 1.5 AMP. TO 10 AMP. JOY STICK Master controller Series are used to control of control of electrical drives of EOT cranes,hoist,transformer cars, grab-buckets, up loaders, steel mills, conveyors and other heavy material handling equipment's. Double brake contact with high quality silver cadmium oxide Conant tips having arc-retarding anti-welding properties. Provided with special rubber gaskets on the cover to make it dust proof. Cams and contact block of high grade phenolic fibers molding material having excellent electrical mechanical properties. Star wheel for positive notching at each step and pronounced notching at neutral. 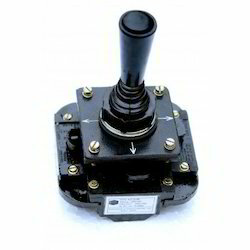 Joystick master controller are also noted for ease assembly , dis-assembly adjustment as well as free access to all the parts. Long life reliable performance and trouble free operation. Electrical life : 2 lacs operations. Looking for “Master Controller & Joystick Master Controller”?